Guess what I'm going to spend the weekend doing? Yes, this Girl Scout Leader/Mother will be supervising as her daughter works cookie booths. No matter where you live in the U.S. our goal is for you to be accosted approached by a charming Girl Scout who is practicing her real-world skills of goal setting, decision making, money management, people skills and business ethics. As leaders are told time and again, cookies aren't just fundraising, cookies are Program. Different troops give different amounts of emphasis to cookies, though often cookies are what people think about when they think about Girl Scouts. Unfortunately, fund raising is necessary for most youth activities or only kids whose families have money could participate in many things. Since you will hopefully be asked to buy cookies this weekend, I though I'd tell you a little about them. Who Gets the Money for Girl Scout Cookies? The lion's share of the money earned by Girl Scout Cookies goes to local Girl Scout councils. These non-profit corporations are responsible for recruiting and training leaders, recruiting girls, providing programming, enforcing standards and they are the entities that own and operate Girl Scout camps. Councils employ both professional year-round staff and temporary camp counsellors, and for most councils, employee pay is one of the biggest expenses. Of course the other big expense is the camps. My council owns three of them and they are well-equipped facilities with full kitchens, cots with mattresses, cabins and platform tents. One has horses which have to eat daily, even if girls are only at the camp on the weekend. The amount of money that goes to the troops--the groups of girls who actually sell the cookies varies depending on the council and on the incentives set by the council. Here, we sell for $4.00 per box and our troop proceeds start at $0.50 per box and can get up to the mid 60's depending on the number of boxes sold, whether we participated in fall product or registered early last year and whether we waive prizes for individual girls. Individual girl prizes cost about five cents a box. In some ways, that doesn't sound like much, but when you figure that around here, selling 100 to 200 boxes isn't a stretch, tell me another fundraiser we could do, especially with the under ten set, that could earn us $50 to $100 per girl, mostly from people who are not family members. My daughter has a friend who really needs fundraisers in order to take the troop trips and she regularly sells over 500 boxes a year. It depends on local councils. They each negotiate with the bakers (there are two bakers that make Girl Scout Cookies) for the best price/terms they can get. Then they look at their needs vs their expected sales vs what they think the market will bear, and after factoring all that in together, arrive at a price. Right now, most councils are at $4.00 a box for most cookies and $5.00 a box for gluten-free cookies. I've heard one is as low as $3.50 and some are $5.00. Do Girl Scout Cookies Support Any Groups but Girl Scouts? Not directly. As noted above, most money goes to the councils and the councils do not donate money to any other groups. Troops are encouraged to use part of their cookie proceeds for service or "Take Action" projects. Generally speaking, troops are not allowed to donate money to another organization or individual. They are allowed to use troop funds to purchase things for other groups. What If I Gave Up Sweets for Lent? Girl Scout Cookies freeze well. Can Vegans Eat Them? What About People Who Keep Kosher? Those Who Can't Have Gluten? If the girls in your area are selling Caramel Delights and Lemonades, you are in an ABC Baker council. Girl Scout S'mores™, Lemonades™, Thanks-A-Lot®, Thin Mints and Peanut Butter Patties® are made with vegan ingredients. ABC also offers the Gluten-Free Trios Girl Scout Cookie, which is certified by the Gluten Free Certification Organization, produced in a dedicated gluten-free facility, and meets a 10 parts per million standard set by the Gluten Free Certification Organization. While ABC's cookies made with vegan ingredients do not contain any animal product ingredients, they may be produced on equipment that is also used to produce items containing dairy ingredients. Those charming sales associates in Girl Scout vests or tshirts should be able to offer you an alternative--if you can't eat them, treat them. Each troop picks a charity to receive cookie donations. These range from food pantries and homeless shelters to our overseas troops. 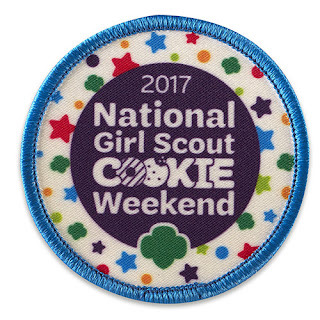 Happy Girl Scout Cookie Weekend; enjoy your cookies! Until recently, one thing that kept small investors from investing in individual shares of stock vs mutual funds was the fees charged. Most brokerage houses had a minimum fee per transaction and if that transaction only involved a few shares, the fees made it cost-prohibitive. The advent of the internet and electronic trading has made it possible to reduce those fees considerably, to the point that it is possible to buy a single share of stock in one company or even fractions of shares. Let's take a look at a few of the companies set up to serve small investors. Stockpile charges $.99 per trade, and offers a large selection of stocks, though not the entire market. The market they seem to be trying to reach is that of the young and inexperienced investor. Stockpile's website includes a "Learn" section which includes articles on such topics as "What is an Exchange?" and "What Is NASDAQ?". The articles are short, informative and easy to read. Another way Stockpile reaches small investors is by offering fractional shares. As of this writing, Amazon stock costs $1448.69, which is more than I want to invest in any one company. Stockpile allows me to pick any dollar amount to invest, so that I could invest $145 and get 1/10 of a share of Amazon, or $14.50 to buy 1/100 of a share. A unique feature of Stockpile is that they offer gift cards, either physical or virtual. With Stockpile I can choose to give you stock in Disney rather than Disney bling. However, when you go to redeem the gift card, you are allowed to invest that money in any stock you please, so if you prefer Universal to Disney, go ahead and switch (and you don't even have to tell me). Stockpile does not charge account maintenance fees and they do not offer IRAs. However, they do offer custodial accounts for minors. With these accounts, an adult custodian is responsible for the account, but it is owned by the minor. Minors can be given their own log in information. The only difference is that when a minor tries to enter a buy or sell order, the request is routed to the custodian for approval. 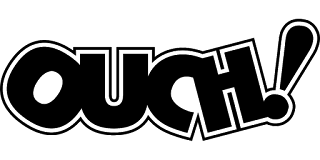 If you want to get started with Stockpile, clicking this link will give you $5.00 worth of whichever stock you want. The main disadvantage of Stockpile is that trades are made at the closing price the day you order them. You cannot make a quick choice to get out NOW, and, if the market drops noticeably between the time you requested the trade and the time it executes, you may find that you don't get the price you were expecting. Stockpile charges $.99 per trade, so if you are buying a very small amount of stock it could get expensive on a percent of assets basis. I recommend a minimum investment of $100.00. Other fees include a 3% debit/credit card fee (though you can transfer money from your bank account at no cost) and a $2.99 gift card fee. While there are other fees, these are the ones most investors will be most likely to see. Motif's claim to fame is enabling small investors to buy fractional shares of a variety of companies in one basket, dubbed a "Motif". Motif offers some professionally designed motifs as well as many designed by ordinary people. If you design a motif and convince others to buy it, you will get a sales commission. The minimum amount of money necessary to invest in a motif is $300, and each motif can contain up to 30 different stocks. Motif recently changed its fee schedule. Now, you can get commission-free next market open trades of both individual stocks and professionally designed motifs. If you want to trade in real time, professional motifs will cost you $9.95 per motif, a motif you build is $19.95 per trade or if you want to trade single stocks, the fee is $4.95 per trade. For larger or more active investors Motif offers "Impact" or "Motif Blue" accounts. An "Impact" account is a fully-automated portfolio what is automatically rebalanced and which has a composition that changes as you age. Regarding the cost of an Impact account, Motif says "The fee structure for a Motif Impact account, that provides a fully automated portfolio aligning your financial goals with your values, is 0.25%, expressed as an annual fee rate." A "Motif Blue" account is one in which you pay a $19.95 per month fee in exchange for three "free" real time trades per month, plus real time quotes. If you would like to try Motif Blue, click this link and you will get three months free. Motif is now charging $10 per quarter for each account that is under $10,000 and which has had no commissioned trades in the last three months. In my opinion, that cost is high, percentage-wise, if your account is much under $5,000. Right now I own eight professionally designed motifs, most of which were purchased when Motif was offering them at no commission as "motifs of the week". I also own one that I designed, which I did pay a commission to purchase. Today I made my first use of the commission-free trade service and used my accumulated dividends to buy a fraction of a share of NVIDIA. If you would like to try Motif, use this link; you'll get three months of Motif Blue (and then you can decide whether to keep it or not) and I'll get one. Motif's strength is allowing you to spread a moderate amount of money among a large number of stocks for a relatively low amount of money. However real-time trading will cost you, and fees will disproportionately affect small accounts. Robinhood is a smartphone app only (for now) brokerage. They are planning a webpage but it is not live yet. The app is available for both Apple and Android phones. While Robinhood does not offer IRAs, it offers margin accounts and is in the process of rolling out options trading and crypto-currency trading. Stock trades on Robinhood are in real time but most users are not allowed more than three day trades (buying and selling the same stock on the same day) per five day window. Trading on Robinhood is commission free, which makes it easy to buy and sell one share of stock at a time. One nice feature is "instant deposit". Once your bank account and Robinhood are linked, you can deposit up to $1,000 into your Robinhood account and have instant access to it. When the market fell quickly last week, I deposited an additional $200 in my account and went shopping. I did not have to wait for the check to clear. Robinhood offers a margin account, known as "Robinhood Gold" Besides allowing you to borrow money with which to buy stocks, a Robinhood Gold account allows you extended trading hours and a larger instant deposit. I find the Robinhood interface to be easy to use. When I log in I see my account balance, along with how much it moved that day. As I scroll down I see each company in which I own stock with a notation of how many shares of each I own. There is a small graph that shows whether the stock is up or down for the day, and the latest price per share. If I click on any company, I get a graph that shows its movement in the last day, week, month, three months, year and five years. I can click to buy or sell. I can scroll down and see what my equity value (shares times share price) is, and how much my average price per share was, and my percentage return both in total and today. I can see my history with the stock, along with an earnings chart. Often there are links to articles about company. If you would like to invest via Robinhood, use this link and we both get a free share of stock. Honestly, it depends. I have accounts with all three. Right now, I have little reason to use Stockpile. My Motif account is almost $10,000 and with their new pricing structure, I plan to bring it up to that level soon, thereby eliminating the quarterly charge. For people who have an account big enough to avoid Motif's fee, I'd recommend using it to purchase fractional shares, as you can do so without commission. If you do not have that much money and want to be able to purchase fractional shares, I'd recommend using Stockpile for that purpose. For purchasing shares in companies you can afford to buy full shares of, I'd recommend Robinhood. It is free, easy to use and trades in real time. The only downside is that you have to use a smartphone, at least right now. Motif is the only one of these companies that offers IRAs, but unless you have $10,000, the fees get high. If you are interested in opening an account with one of these companies, please use my referral links. Ouch! 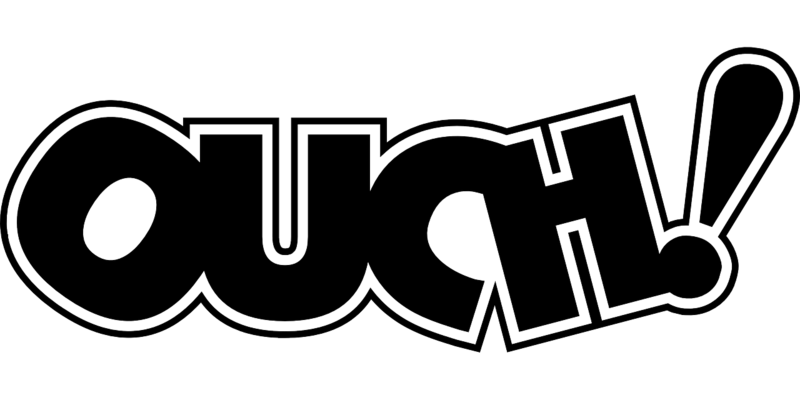 That Hurt!...or Did It? In case you've been under a rock, or never look at the financial news, let me tell you--the stock market took a dive this week. While I can't speak for everyone, I can tell you that with our diversified portfolio, we lost everything we've gained since Thanksgiving. Put another way, we lost five percent of our invested assets. OUCH, right? Well, we had just passes a milestone, so it isn't fun to see it slip out of our hands, but on the other hand, none of that money was earmarked to pay bill this month or even this year. At this point, other than a few small dollar stop-loss sales, we haven't LOST anything except on paper. We still have the same number of shares of stock or mutual funds. While there are a lot of factors that do into the calculation of dividends, this week's pullback isn't making companies cut dividends, In short, unless we need to sell, this pullback is not going to change anything. According to the front page of my 401k's website, last month my 401k, which includes about 30% bonds , gained 3.8% in January. Think about that--annualized, that is over 45%. It doesn't take a genius to figure out that such increases couldn't continue long-term.. 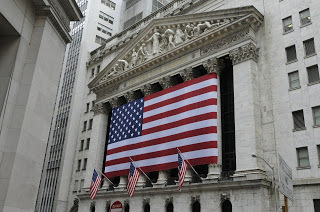 There are two major reasons stock prices fall. The first is a real or perceived flaw in a particular company. For whatever reason "everyone" decides that XYZ is over-valued and they reduce the money they are willing to pay for it. These reasons run the gamut from poor earnings to a new competitor to investors believing the market for XYZ products has dried up. If shares of most other stocks are going up in price (or holding steady) and XYZ is dropping, beware XYZ, unless you know something the general public doesn't. Yes, it may rebound, but there is a reason all those professionals don't want it. The second reason stock prices fall is because the market as a whole is dropping; often due to some news or economic trend. When that happens, it is like your favorite store putting a great big "Sale" sign in the window. The shares that cost $17.00 yesterday cost $15.00 today, but nothing has really changed about the company. It is still selling the same widgets, it still has the same managers, and that means, in my opinion (and I'm not a financial professional and only play like I know stuff here on this blog) that it is time to buy. Now is not the time to change your 401k asset allocation to all bonds. Now is not the time to sell all your stocks. You picked your asset allocation for a reason. Unless something in your life has changed, that reason should still be valid. If anything, now is the time to see if you have a few extra dollars laying around with which you can buy stocks or more mutual fund shares. Last week I wrote about AT&T. I bought my first two shares in November, for $37.67 each. Since then each share has paid me dividends of $2.46. Last year the dividend was $.49 per share; in February it went up to $.50. Earnings per share are up in the last year. On February 1, shares closed at $39.16; on February 8, they closed at $35.57, over 9% lower. Did something happen to AT&T? Did a deal fall through? Was the CEO caught with his pants down? Were they sued? Nope. There is always some news about a company that big, but the bottom line is that this price differential has little to do with the value of AT&T and everything to do with market conditions. What did I do about it? I bought more shares. On February 6, I bought a share at $36.00; on Feb 7 I bought one at $37.00, and on Feb 6 I bought 2 at $36 and on at $35.95. Now my average cost per share is $36.61. Assuming a $.5 dividend per share per quarter, (and everything I've read leads me to believe that dividend is safe) I have a 5.4% return on my money, as long as the price eventually goes back up (which I think it will). Since Robinhood allows me to purchase individual shares of most companies in realtime for no commissions when the market drops like this, I pulled out my phone, transfered money from my bank account to Robinhood and set a limit order (told Robinhood to buy a share for you if the price drops to a certain point). If you want to try Robinhood use my link and you'll get a free share of stock, and so will I. Last time someone used my link I got a share of Sprint. I don't know what the other person got, but if I was you, leave a comment and let me know. Basically what I'm trying to say is that while most people will say their goal is to buy low and sell high, research indicates that most people do the opposite. In January "everyone" was buying, and stocks were getting more expensive by the day. In the last two weeks the price has dropped and people want out, and I'm buying. Are you? When I say "retire", what comes to your mind? The beach? Your bed? Fun? Boredom? 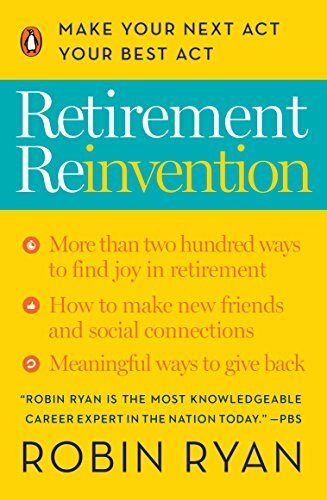 In Retirement Reinvention Robin Ryan pushes the idea of retirement being not the time after you quit your job but the time during which you participate in activities (possibly including jobs) that are fun and meaningful to you. Instead of your 66th birthday being the end of your working life, Ryan suggests you see it as a new beginning. Robin Ryan uses stories of real people and how they have been able to make a difference in a way that is meaningful to them. Some have started small businesses, others have taken up time-consuming hobbies while yet others have chosen to learn something new. The key to a successful retirement is choice--you may not make a fortune blogging as a hobby but if writing is fun, you can try to build an audience (and since you don't need one, you don't have to do SEO research, create pinworthy graphics or maintain a mailing list). One thing I do regularly is peruse the posts on Rockstar Finance and last night when I was starting this post, this one caught my eye: Our "High School Rule" for early retirement. The ideas are much the same as expressed by Robin Ryan. If you are trying to figure out how you are going to spend the rest of your healthy left Robin Ryan has a lot of good ideas of things to do and suggestions about how to get started.